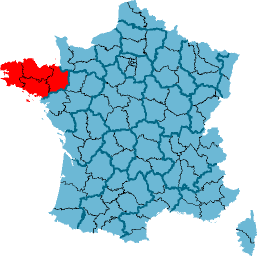 Brittany (French: Bretagne, Breton: Breizh; ) is a diverse region of northwestern France. The historic Britanny includes these four départements PLUS the Loire-Atlantique département with the city of Nantes. Brittany received its modern name when it was settled (in around 500 AD) by Britons, whom the Anglo-Saxons had driven from Britain. Breton history is one long struggle for independence — first from the Franks (5th-9th century), then the Counts of Anjou and the Dukes of Normandy (10th-12th century), and finally from England and France. The Breton people maintain a fierce sense of independence to this day, as displayed by their local customs and traditions. In the past 5 years or so a resurgence of the regional identity has happened in France. Breton art, music and culture are recognized across the nation. The people of Brittany all speak French, many speak the regional Breton language Breton, but many speak English very well too. While France tried to discourage the use of regional languages, their use is rebounding, bringing a stronger understanding of culture, contributions, and history. Through the local efforts of the Bretons and their DIWAN (Breton language schools), children are being taught in the native language while they learn standard curriculum. The DIWAN schools are supported by world wide efforts through various groups, including the International Committee for the Defense of the Breton Language. The TGV train runs almost hourly from Paris Montparnasse to Rennes, Brest, Quimper and Saint-Malo. The A11, the Océane Route, links Brittany to Paris. A dual carriageway runs from Rennes to Nantes, and there is a motorway from Nantes to Bordeaux. SNCF offers bus services from all major rail stations in Brittany. In Brittany, all roads are free (no tolls). Menhirs and Dolmens Brittany has a large number of megaliths, which simply means “big rocks”. These menhirs (standing stones) and dolmens (stone tables) were sites for burials and worship. See some magnificent examples at the bay of Morlaix and the gulf of Morbihan. Museums at Vannes and Carnac detail the archaeolgical finds made at these sites. Walk the GR34, . The Grande Randonnée 34 (also known as Le Sentier des Douaniers) is a 1,700 km walking trail which hugs the coastline of nearly the entire Breton peninsula. The elevation changes are mild, making this trail enjoyable for either a few hours or, for avid hikers, a few days. Many locals around Saint-Brieuc will recommend traversing Cap Erquy and Cap Frehel in the north, and those who heed their advice will be treated to a spectacular coastal scenery. When swimming in the sea, watch out for rips and undercurrents. Be mindful that the tide can come at a very fast pace so watch out or you might be stranded on an outlying island! Check the tides (marées) in your local tourist office. Ask for a table of the tides. Mont Saint Michel – in Normandie, but very close to the Brittany border; monastery and town built on a tiny outcrop of rock in the sand, which is cut off from the mainland at high tide. It is one of France’s major tourist destinations, and as such gets very busy in high season. Check the times of the tides before you visit!